I hosted a storytelling salon with friends at home recently (first time to host one there). It was eye-opening fun and unforgettable. This salon experience taught a lot about group dynamics based in a storytelling environment. 1 — Vulnerable and forthright group sharing emerged, more so than what I first expected. The group’s response to the salon’s storytelling theme was more participatory and disclosing than what I anticipated. This was beautiful to engage in and observe; the intimate, sensitive journeys people offered were truly something to honor. The story salon’s structure involved a pre-set theme called: Home-stories of retreat and reunion. The group dynamic unfolded in two ways: I first welcomed everyone and then opened the discussion by sharing a few stories about family that resonated the theme for me. I stood up to present, as friends listened in circle-seating while munching on breakfast. This took 25 minutes, longer than what I envisioned. After this, friends were invited (…not pressured!) to share their stories and perspective with the ‘home’ theme as a guide. Folks could present their insight standing or sitting, whatever felt natural. People began to offer really emotional and personal experience…moments that made a raw, penetrating effect on their home life: the painful bewilderment when parents die; acts of rebellion to family authority; and changed recognition of what home is and what it isn’t. Limit opening facilitation to 15 minutes vs 25. Overall time ran out where each guest had told a story…except for one. Yikes! She was so gracious about it. The salon’s ultimate intent is to create an agile, attentive listening environment for those that want to share. One that embodies ample time for each person (who wants to give voice) to do so. So I definitely want to shorten my intro bit. Also — possibly suggesting folks keep their stories to a certain time frame may help too. …..will ponder what can help inclusiveness more on the time front. 2 — Clarifying at the start how intimate story gatherings can affect the senses provided useful groundwork. Before diving into the story-sharing piece, I offered clarification on how – potentially – this intimate spatial dynamic could impact us consciously or not. Often when a small group sits near one another (our seating arrangement is pictured just below) — the exchange of attentive energy stimulates the senses in certain ways: hair may raise up on arms; faces may blush; deep deep breaths unexpectedly may inhale/exhale; emotional candor often intensifies. Physical or emotional reactions certainly are not an automatic byproduct; but given this was the first salon for us to host at my home, it seemed wise to be overt about how direct, close-proximity storytelling can engage physicality (and emotional life) sometimes unexpectedly. Tears and shaky voices ended up as apart of people offering their perspective. Random spikes of humor popped out. Lots of gentle accepting silences surrounded our stories too, along with I believe, a sense of okay-ness and affirmation. Starting the salon with this little orientation piece is actually a no-change keeper. Folks offered appreciation for it later on. So if different people attend the next event – I’ll lean on this decision again with hopes of cultivating similar safety when it comes to supporting folks that want to open up. 3 — Recording audio devices were an offered tool for any storyteller, but folks weren’t into that. I offered anyone to record their stories via a mini handheld audio recorder; tellers could simply speak into it as if it were a mobile mic. I find it useful to review told stories after the fact for growth & education. But no one else sought out the recording option. I’m better realizing that for me, I gain sense of community and also increased joy in the craft when reviewing audio later on. Others though may primarily seek the community, cathartic aspect of this type of gathering (vs viewing it as a more formal source of storytelling practice). This is absolutely natural, now that the differing expectation is clearer to me post-event. Hmm, I’m not 100% sure if this even warrants a change. The salon ended up being a pretty personal, tender arena. Informal. I want those elements to be honored, preserved, and to carry over to future gatherings. But something about making this audio tool resonates, making it at least available to folks if they want to study or reflect on their oral storytelling at a later time. I may mention it again next event so people know it remains a potential tool at anyone’s disposal. Looking forward (a lot) to pondering the next salon theme (and for it to hurry up -n- get here!). One of my “…just do it” goals for this New Year is to enjoy friends more often through casual storytelling and conversation. That goal began brainstorms for a storytelling salon event series at my home. The first storytelling salon for the year happens (gulp!) tomorrow. Adrenaline accelerates with every minute over here with last minute planning! What the heck is a storytelling salon? It is a personal, subjective experience to define for sure. But I work with this approach: each story salon occurs on the weekend at my home/apartment building, and includes hospitality for the first hour; then oral storytelling of archived stories that I’ve wanted to share with community for many moons; and casual theme-based group discussion afterward. The overarching interest is good ole community with friends in the context of storytelling and learning each other’s life experience more. 1. Deciding the core focus has been useful i.e. to cultivate an intimate story experience & environs for sharing personal perspective. Once this focus for the salon crystalized more, other party-related or social options faded to irrelevance. The intent is creating a type of ambience where friends would ideally feel comfortable spending time (and opening up more too to the story-sharing aspect). Physical space – how it can affect the flow and disposition of people – has been an interesting consideration. The party room on the third floor of my home’s condo building turned out to be a better space conducive to intimacy (vs our specific home unit). There’s a slightly higher ceiling that some say can cause people to associate ideas more freely (…getting a kick out of that tidbit). Restrooms and a roof deck are feet away when folks need alone time. The main element with this salon idea is to create an agile, non-demanding dynamic for friends that sometimes complex hospitality environs can distract from. A non-existent white glove treatment is the point. Think lots of cushy sofas and puffy-fluffy chairs organized in circle-seating; soft natural window light; a few candles; low overhead lighting; and the U2 playlist playing at a lower hum. 2. Choosing a potluck-brunch approach to hospitality has helped achieve simplicity and pre-salon collaboration. At first when planning loosely began last December, I leaned toward a full menu to provide buddies. But then I frankly felt the stressful stomach knots form. So a friend suggested a potluck option which has been fun and a creative collaboration for the group. When sending the save-the-date notice out a while ago, I tossed out a link to potential brunch food ideas (cinnamon rolls or bagels or french toast for starters or other options). The group approach has helped keep the planning spirit light, and attention more on the storytelling piece. 3. Setting a story theme and an unconditional tenor toward participation has added needed, unobtrusive structure. The story theme is: Home – running away and reunions. In the spirit of facilitating greater focus and ease for guests — I suggested a theme for them to (casually) reflect upon before salon day. The theme’s purpose is to provide perimeters regarding topic. Often in a public dynamic like this, a non-topic driven gathering can overwhelm concentration or prevent precise memory recall from kicking in. In hopes of generating more ease and willing participation, the salon will start with a story from me about home in Oklahoma growing up…roughly a 7 minute story. Then afterward, I’ll welcome other people’s perception of their home experience with an opening question. Guests can share their reflections as they’re open to it. If everyone is shy and isn’t down for sharing, no sweat! We’ll simply continue to snarf down cinnamon rolls and kibitz. It continues to be a blast to plan and anticipate. Looking forward to learning about friends more tomorrow, their stories from home, and tons of photos to relive the joy. Storytelling, especially short-form storytelling, remains ever on the mind these days. I’m getting excited about preparations for a new community-wide open mic night starting in DC’s Dupont Circle neighborhood this spring (more to follow as logistics solidify). In the interim, these preparatory efforts cause reflection for how storytelling often takes such a hold on people’s attention and emotional terrain. There are so many horizons of answers and resources to that question depending on the types of listeners a storyteller wants to engage. But what stands out to me about telling stories (and listening to them too) is how inherently generous the experience can be. Storytelling at its most fundamental root is an unconditional act of hospitality; and there are three structural pieces to story creation that really flesh this premise out. Whether you plan to tell a story in an in-person dynamic, or via audio or video, this crafting approach can really strengthen the vitality, and inclusive, giving nature, of what you create for (and with) your audience. Perceive the beginning few seconds of your story as a gift of invitation to your audience; this gift will come packaged in the form of basic context for your story. A simple yet distinct few sentences constructs a mental starting point for your listeners. This starting point, consciously or not, orients the brains of your listeners to the mental journal that you will take them on. This orientation is structurally comforting (again this usually transpires on an unconscious level of experience for your listeners). But this structural comfort is very much an act of welcome to the audience. It makes the listening brain more willing to be vulnerable, and to travel the unknown territory of your story. This step forms a relatable foundation from which to launch your journey of meaning (and overall sense of progression) as storyteller. Without this initial structural decision, audience attention can easily get disoriented (and not stay in tune with your unfolding progression). Setting this context can involve just a few sentences. Consider how you would start sharing a story with a friend at a coffee shop…. conversational, intentional, with a desire to simply take your friend mentally along with you on a storytelling journey. Perceive this next component of your story as a chance to shape for your listeners a new but relevant environment. Your mindset in crafting this next piece is still one based in unconditional sense of welcome. As in, your listeners can bring any and all unique skills of imagining detail and interpretation — even with not having lived through your personal experience (and your personal visions of it). Do not fret about imparting every single visual element about this scene to your audience. This scene simply needs get them to the next level of action which your brief context opened the door to. In this structural organizing of your story — take your audience mentally to a particular arena where you can both evolve visual placement for them, but also evolve meaning too. They don’t need to receive and consider every single detail that you have the ability to offer them. The goal with this scene is to directly make the story relatable and useful in your journey of perspective that you’re taking folks on. You are placing your audience — together with your unique perspective — in a well-articulated scene (but one that’s not suffocated with excessive trivia). Begin to get clear to yourself as storyteller why this scene has unique meaning for you. “I love playing piano at choir practice” — per the above first-step sample. Perceive this concluding step as the chance to create new perspective for the audience; this is the chance for you to thread your entire storytelling journey together by making clear what your previous scenic moment or moments mean to you. Consider this ending structural piece like it was an Easter morning sunrise just for your audience: your story’s fresh arrival point to a new and generous truth, meaning, or insight. Reflect on what potentially affected you or surprised you or what you were grateful for or relieved by from the scene you just walked your listening guests through. Let us continue with the sample story-building exercise from the previous steps. Photo, top, “Sunrise-Easter 2006” by Matt and Polly Freer licensed under Creative Commons. Photo, right-middle, Easter Morning Fog by Jason Mrachina licensed under Creative Commons. The Code of the Samurai aka the Bushido Code keeps running through my mind as an ancient-gone-modern reference guide for delivering (consistently) awesome hospitality. A thrilling experience comes to the forefront that puts this into better focus. A few years ago my church (Foundry UMC) was gearing up to celebrate its Bicentennial anniversary. It was exhilarating. Many folks from the local Dupont Circle community in DC; national Methodist connection; past pastors of the church; and city and even national leaders planned to attend this gigantic celebration. Our mindset was to be all the more radically sincere, consistent, agile, and fully filled with welcoming attention. Foundry’s Pastor Ginger often inspired the church members, legions of volunteers, and staff with reminders that we were deepening and enriching the church’s very own standard of ‘radical hospitality.’ The passionate, well-rounded dedication (and tactical support) to achieve this level of hospitality was a dream come true. I was proud to work with this congregation in this moment. Then it all got really, really real. After over a year of planning – the sun finally rose on the big day and nudged all preparation into high-octane immediacy. Beloved neighbors, friends, & family lined up long before our church doors opened hoping to get a good seat; DC mayor’s office called every few minutes with her advance team’s revised arrival time; Secretary Clinton, President Clinton, and daughter Chelsea would arrive once their secret service team finished their rounds. An alternate community like no other was taking shape to celebrate our first 200 years in Christian faith. Volunteers attended their stations — in the balcony; in multiple aisles in the sanctuary; greeters in front hospitality; welcoming, directional folks near the restrooms; the fellowship hall; on the outdoor grounds; the Green Room. It was an awesome, in-sync, and bubbly solar system of hospitality teams. The awareness was at a fever-pitch to acknowledge guests, guide traffic, convey resourcefulness, and love-thy-neighborness at every turn. It became clear in that moment to me that Pastor Ginger’s words outlined hospitality as an extension of hospitality justice — a beckoning to everyone no matter their reality in modern society. We were a historical congregation honoring our 200th year of devotion to loving God and neighbor, and all the vulnerable rigor living in community can require. That’s when an unexpected reservoir of courage and self-control surfaced. These specific code of the samurai virtues immediately became relevant and necessary. Because this was a chance for us to reflect God’s emancipating love in our little corner of the world. Holy. Wow. Radical hospitality meant our team stepping into a radical availability to not just welcome but to engage countless levels of collaborative readiness. As in, it is not enough to simply recognize that ‘all guests whether they are state leaders or not deserve splendid attention and resourcefulness.’ It takes conscious assertion of courage in the present time (which I find can be challenging or even intimidating…per secret service scenario!). This whole hospitality experience and the environment Foundry UMC created that day provided unparalleled education. The event offered irreplaceable forums to better control adrenaline and anxiety, and to direct both as courageously as possible to delivering hospitality with equity to every soul in the place. There’s nothing like a saga about a samurai’s honor to get the mental juices reflecting on (unexpectedly to me!) hospitality. After watching The Last Samurai again, and becoming utterly more enthralled by it, I hungered to learn the ethos of the samurai warrior (also know as The Bushido Code). The full code is comprised of eight virtues, creating an integrity-rich and spiritual combination of disciplines to abide by: rectitude; courage; mercy; politeness; sincerity; honor; loyalty; and self-control. Many virtues from the Bushido Code strike a cord, and compel strong principles for delivering hospitality. I look forward to exploring these in the coming days. According to the Samurai’s spiritual path and code of conduct, deciding the moral course and not wavering from that course is vital. It is this undeterred commitment to honest, moral reasoning that gives stature to the samurai’s day to day life. Such an unwavering commitment makes this virtue a great ethos for delivering front of house hospitality, especially when it comes to in-person guests. So many details compete for attention when running a hospitality-based organization. In the administrative intensity, attention to the in-person guest can often get marginalized or become chronically distracted. What’s key is for the front of hospitality team to — unilaterally and reliably — prioritize the in-person guest over all other commitments or interruptions. It is the only way visiting guests will begin to trust the resourcefulness and sincerity of welcome in an organization. A while ago, I was engaging an in-person guest at front hospitality for a large urban church. While attempting to be a resource to this visiting person, a colleague interrupted our discussion twice. The interruptions were vivid and distracting enough that the guest criticized my colleague (to me) once my colleague had departed. The guest felt undermined and not taken seriously. The next part of our exchange involved my apologies, and attempts to rebuild the guest’s interest in church programs. It is critical that an organization’s entire culture is committed to all guests receiving prioritized, undivided attention. Otherwise delivering hospitality to visitors becomes at the very least, an exercise in depleting good will to guests. In the coming days, I look forward to comparing more of the Bushido Code to other aspects of delivering hospitality, including courage and self-control. It was a quiet early fall night in DC. The outdoors were starting to turn toward cooler breezy temps. 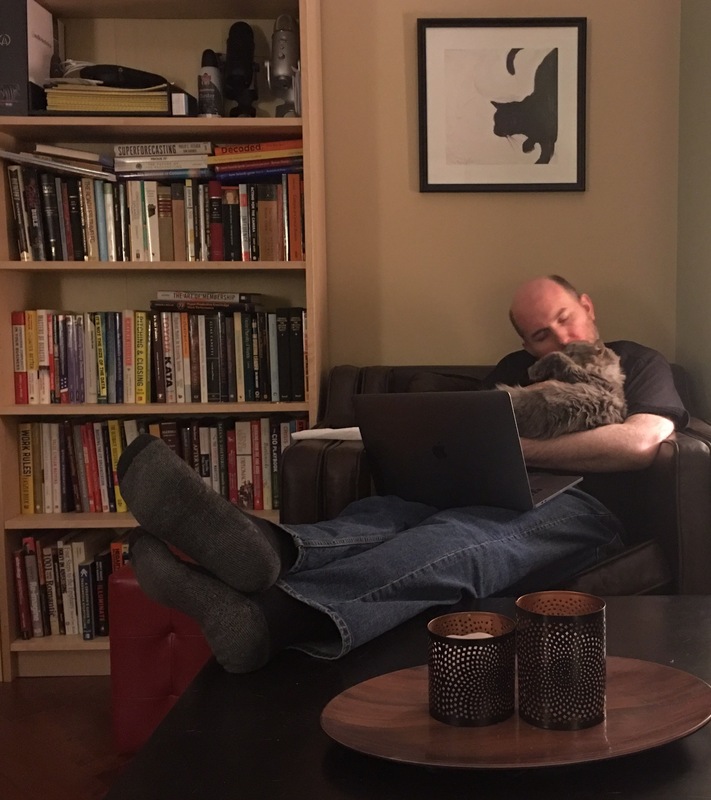 Husband Sean and I were relaxing together in full-on chill time reading and nuzzling with Squinky-Susan (sister kitty) and also Walter Wilbur-Force Buttons (littler bro kitty). Our lights-out time arrived; Sean had opened a window by a few inches to let cooling breezes swirl inside. Off to bed we went, in our 550 square foot home that sat four stories up from a busy neighborhood street. The next conscious cue came from morning light that touched our eyelids awake. Sean got up first to enjoy some early a.m. silence. After a while he nudged me to full-alert. I the momma scurry to the living room. No Walter. …scurry to all the secret under-sofa-and-chair crevices. No Walter-kitten…..just his sister Squinky looking strangely calm. …what about the old-timey pedestal bathtub. There’s a ton of secret hiding spots for kittens! But no fuzzy Walter Wilbur-Force appeared. I look at Sean with my eyes rounding through the tear drops. His fixation on the size of the apartment made my heart ache more. He is such a fantastically logical person; his logic powerhouse of a brain was desperately equating smallness of our home to the impossibility that his cherished soulmate of a (always indoor) kitten could ever get lost, let alone disappear. Walter’s escape out the teeny tiny window space was the only logical conclusion. We ran downstairs; scoured alleyways; searched around big dumpster areas, calling calling calling Walter’s name. No fuzzy gray paws or purrring was to be found. More emotional context: This occurred a few days after Prince died. So the climate of separation anxiety was already heavy! Then after posting one more color poster outside of “Help us find our precious Walter Kitten Face!! !” I glanced back randomly toward the front glass door into the four story walk up (we lived on the fourth floor with a few other neighbors residing on the other levels). There adhered to the glass was a crooked yellow sticky note! Within seconds after calling, Walter Wilbur-Force The Kitten was back home to momma’s caress (and to his papa’s infinite joy). The mystery in Walter’s disappearance revealed in purrrfect clarity thanks to two mindful and very tender-hearted neighbors that lived in a building adjacent us. It’s an awesome urban cat-n-mouse story minus the mouse. It’s a wonderful (and one of my favorite) family tales. What an unforeseen loss of love teaches:Losing unexpected access to the one you love feels like a bucket of pine needles assaulting every avenue of your heart. I revered two things a whole lot more when reuniting with Walter Wilbur-Force Buttons: simple presence of your loved one is the height of abundance; and returning from the hugely vulnerable world unscathed (as Walter did) is ar blessing and rarity. Thoughts about risk and gambling with a stranger:What had happened — Our little precious fuzz-bucket kitten had in Olympic feline fashion self-collapsed his adult frame and slid out into the world (via that four inch window opening…naive move on our end to underestimate the indoor critter). Once out on the window ledge of our building, Walter walked on the ledge; got confused; then couldn’t walk backwards to our specific window. So he walked on the rain gutter to the attached/adjacent building and sat in front of a window. Late, late at night he stared inside this well-lit home through that home’s window and meowed his face off. He sat. He stayed sitting. He myeowed. The couple living in that home noticed him but were wisely leery of his nature! Was this a stray cat? Where did it come from? Isn’t this technically creepy?! It would’ve been in the realm of reasonable decisions for them to have ignored Walter. The couple though pondered; revisited their first impressions; pondered some more. They began to re-perceive this stranger chanting myeows outside their window. They started to view Walter as less of a threat, and more of a misplaced stranger in a vulnerable way. Sean and I are grateful for their courage. Closing thought on alleviating potential tensions in risky decisions:Upon letting Walter enter their window, the couple started to think short-term and long-term. If Walter’s family was discovered in the next day, hooray! But if a reunion did not take place, they were making a hospitality list for their new tenant i.e. litter box, food, and 600 little jingly toys. Their agility is a model for hospitality and for helping the stranger. They went from a risky initial decision all the way to sharing space with a stranger to planning for the stranger’s well-being. My goodness how I love this story and them. Photo: Walter Wilbur-Force Buttons when a baby, pictured with his Dad. How emotional intelligence shaped three hospitality moments, and Happy New Year! Engaging front-of-house hospitality for community fascinates me. Hospitality is an unparalleled opportunity where customer service, sense of welcome, unconditional attention, and even spiritual uplift can all be experienced by a guest. How can guests perceive resourcefulness? perceive responsiveness? or perceive acts of (intended) good will? Guests from different hospitality scenarios in my professional life have taught vibrant lessons toward these questions. And often recognizing the merit of emotional intelligence proved a key part of learnings. Emotional intelligence (EI) affects delivery of hospitality in countless ways. It’s potent and often beautiful how keen emotional discernment can encourage (or if a lack thereof – can repel) any particular community or guest. I should swallow a dose of humility now too because at least for me, emotionally intelligent actions can be easy to overlook or harder at times to appreciate. A friend Sarah shared last week some hospitality moments from her workplace. We then more consciously chewed on what she realized about delivering hospitality in-the-moment from those exchanges (and what stood out from an emotional intelligence perspective). My friend works in a community center and engages a wide range of the public with varied ages, races, and economic realities. The scene — A young mom arrived and shared concerns her pre-teen child was starting to smoke cigarettes. The parent began to stutter pretty heavily, and avoided eye contact with my friend Sarah (who recognized signs of the parent’s discomfort in admitting the whole scenario). EI moment — The goal for my friend became to remove any potential barriers to trust that the mom’s discomfort could possibly develop. So she (the friend) said to the parent she was so grateful she arrived at the community center, and had shared her personal concern for her child. My buddy in that instance affirmed the woman’s presence; the concern for her child’s health; and that the mother’s emotional courage was evident and admirable. The young mom ended up staying for 25 more minutes to discuss potential next steps and resources. The scene — Going deeper into the above exchange, my friend Sarah at the community center also asked the visiting mom questions on a few different levels: permission for time and permission to further inquire about her concerns. EI moment — She (my buddy) used authentic lines of questioning to further demonstrate respect for the nervous, worried parent. First Sarah asked the mother overtly if she had “20 or 25 minutes” to further discuss her child’s smoking habit and the center’s resources to help. Next, Sarah inwardly committed to establishing a listening environment for this guest: to fully listen to the mother’s responses without interruption (as much as possible in light of potential time constraints). These intentional decisions helped to relax the dynamic; the mother started stuttering less and opening up about ways the center could be of benefit. Word of caution — Checking in with this guest on whether or not she had more time to discuss matters goes beyond basic politeness in its value. It is a core hospitality-delivery tool. If the guest did not have further time to invest in that moment, then that would have cued my friend to request permission to email her further information and questions. Therefore, no matter how the mom responds to the question of time – her schedule is honored, and the dynamic to effectively provide resourceful-rich hospitality is still forged. The scene — My friend remembered that toward the end of their discussion, the parent asked a question about potential treatment. Sarah felt some compulsion to respond immediately in that moment. But she refrained. Why? Because she also saw sensitive options (that could help the mother’s child) that would do well with written, deeper context. EI moment — So to ensure benefits and risks would be expressed more clearly, and do the mother’s concerns better justice, Sarah underscored the value of the parent’s question and offered to reply more thoroughly over email. She also invited the mother to set future appointments anytime for more personalized conversation. Word of caution — Delaying a reply in this way is not intended as procrastination, or as a means to avoid sensitive, difficult discussions. The core intent was to acknowledge that a compulsive albeit reasonably informative reply was likely going to come across as scattered. Sarah’s emotional discernment was to avoid that potential guest perception. So she instead, mindfully affirmed the mother’s question and assured an emailed clarification would be forthcoming. Conversations with two different neighbors unfolded within a few days of each other. They keep floating in my head for further reflection. During a front hospitality shift at church (my workplace too back then), I met both of these guests as their initial point of welcome to the church’s campus. The first encounter was with a younger gentleman in his twenties. He was spirited and articulated his words with a little punch….not with a disrespectful tone at all, but with an audible beat of precision. He proceeded to offer his thanks for the church helping him replace his birth certificate a while ago, which was neat to hear! It was motivating to meet him and receive his sentiment on behalf of the team. His speech pattern then began to accelerate. I wasn’t sure what to say beyond some quiet eye contact. His speaking rate continued to accelerate then slow back down, then speed back up as he described his memory loss and eye ball injections. It was clear he deserved compassion, and sincere regard. The guest repeated expressions of appreciation for the church’s volunteer team again that had helped him secure his birth certificate. He mentally bounced in between the contexts of injections, memory loss, & gratefulness. He seemed to want his gratefulness for the church community to be honored in a certain way but I wasn’t sure what to do. It was a sense in my gut that I was trying to interpret. Then mental fatigue really kicked in. I just wanted the exchange to end but wanted to offer some sort of resourcefulness. I asked if he’d like a mini directory about the church and nearby health providers too; I offered my own thanks to him for visiting while directing him to the door. I’m still analyzing this guest engagement from a hospitality perspective. Sometimes providing attentiveness while ignoring some inner bewilderment is apart of extending hospitality. I’m grateful to him for that learning. Something else about the exchange though made an impact that I did not realize until later. A local neighbor arrived at the church asking for a clean pair of jeans. He was in his 40s, had lived on the street a while, conversational (and I recall very warm too). As he shared about his clothing needs, the inner bewilderment from the recent guest last week cropped up. That instantly provoked internal fatigue that in that moment with this new guest, I just didn’t want to feel again. So I interrupted the guest in mid-sentence with the hope to end the conversation. I instantly felt guilt & regret sprout up inside. It was an impatient move to interrupt (and inhospitable to say the least). The man went silent. Conversation with him revealed how I’d held this social bias yet was not conscious of it. Our exchange underscored how delivering hospitality does not simply demand empathetic communications but also unconditional patience even when inner resources may be stretched. It occurred to me later that me being a wee bit mindful of self-care would be goooooooood & prudent. These encounters bring to mind now a devotional excerpt from Sarah Young’s enriching book Jesus Calling. Learn to listen to (God) even while you are listening to other people. As they open their souls to your scrutiny, you are on holy ground. Photo: husband patiently “listening” to the kitten.